我存网——Pope Francis met Italian nurses on 3 February, 2018. English News》Pope Francis met Italian nurses on 3 February, 2018. 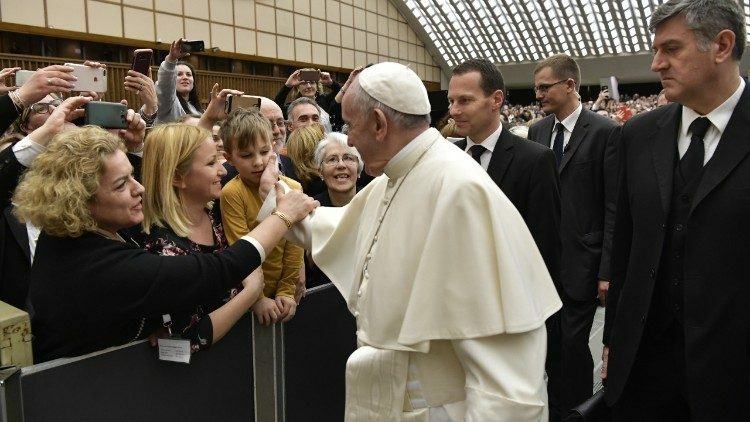 Pope Francis made the observation to some 6,500 representatives of Italy’s National Federation of Professional Nursing Orders (FNOPI), who met him in the Vatican ahead of their congress next week. FNOPI which was formed only on 15 February to replace the older IPASVI federation, has some 450,000 members. Reminding the nurses of the four basic tasks of the nursing ethical code, namely, promoting health, preventing illness, restoring health and alleviating suffering, Pope Francis said their professionalism manifests itself not only in the technical field, but much more in the field of human relationships. This is because coming in contact with doctors, families and the sick in hospitals, places of treatment and homes, they are at the crossroads of a thousand relationships. The Pope said, it is precisely in this synthesis of their technical capacity and human sensibility that the full value and preciousness of their work is manifested. Holding out the episode of Jesus healing the leper in Matthew’s Gospel, the Holy Father stressed on the importance of physically touching the sick in order to remove the distance and making the sick experience the closeness and tenderness of God. “With bitterness one cannot understand the sick. Tenderness is the key to understanding him, and is also a precious medicine for his healing,” he explained. Pope Francis acknowledged the risks and hard demands of the job of nurses and urged patients to appreciate their work. In this regard, the Pope recalled with gratitude an Italian Dominican nun and nurse, who he said saved his life. As a young man of 20, when the Pope was close to death, the highly qualified nun and professor who worked in Greece and later in his native Argentina, argued with the doctors to do more, which saved his life. Naming her as Sr. Cornelia Caraglio, the Pope said she was a “good and courageous woman who dared to argue with the doctors”. The Pope thus thanked the nurses because, he said, through them many lives are saved.